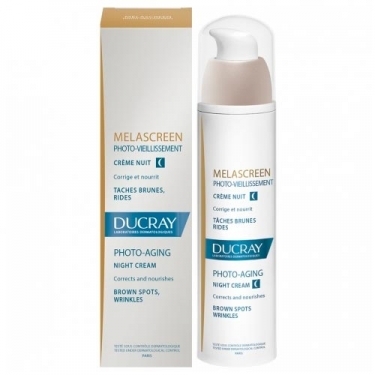 DESCRIPTION: Melascreen Crème Nuit from Ducray is a nourishing and depigmenting night cream that corrects and attenuates spots of hyperpigmentation and loss of firmness. With a rich and moisturizing texture this night cream is recommended to act against the premature aging linked to the sun, brown spots and loss of firmness of the skin. Its concentrated formula contains several active ingredients: the Synerwhite complex, which corrects brown spots that limit the synthesis of melanin; vitamin C, which increases the production of collagen to help fill wrinkles; hyaluronic acid, which helps replenish the skin. Non-comedogenic. No parabens. Dermatologically tested.